How Much Do Celebrities Get Paid To Promote Businesses On Twitter? Some celebrities around the world are charging businesses an impressive amount of money as a fee for promoting them via a 140-character tweet! Huffington Post released an interesting infographic in May 2013 entitled “How Much do Stars Get Paid To Tweet?”. 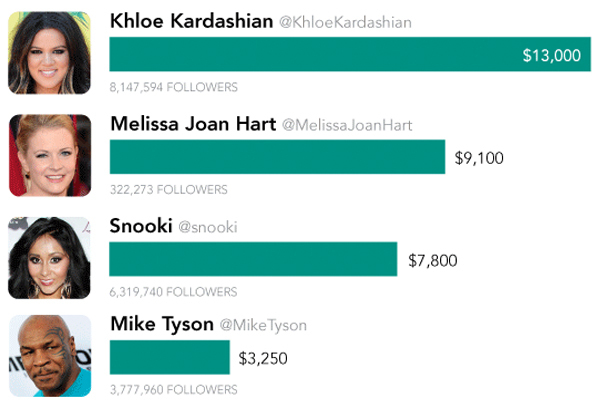 Numbers are huge and it is not always proportional to the followers numbers: For instance, Snooki will charge $7,800 for a tweet to her 6 million+ followers while Melissa Joan Hart will charge $9,100 for her 300,000+ followers. By the way, what do you think of Khloe Kardashian and Jared Leto charging $13,000 per tweet? The number is so huge, you most probably missed the fact that Kardashian (8 million+ followers) has eight times more followers than Leto (1 million+ followers).